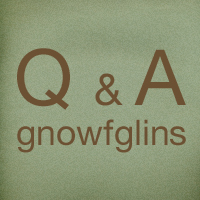 Welcome to the Question and Answer series at GNOWFGLINS! Many questions come through the comments or the contact form; some of them can be better answered by reaching out to all of you for your input. So, please jump in with your thoughts, suggestions, and best advice to help a reader out. I am trying to move my family away from anything containining BPA and am looking for advice on what type of storage containers to use in the freezer. Do you use glass? I usually cook several meals ahead and put them in the freezer to reheat later in the week. To date, we've been using tupperware, but now that Jakob [her son] is eating the same food that we do, I want to move to something safer for all of us. I appreciate your advice! First, what is BPA? It is key component in polycarbonate plastic (and cans for canned goods) which is linked to serious health concerns. First, Anchor Hocking has some great glass storage dishes that go from the oven to fridge to freezer to dishwasher. They are fantastic! But they're spendy. They will last us for our whole lives, so we felt good about making that investment. They're a great solution for bake ahead meals. Bake in them and once the meal is cool, move the whole thing to the freezer. They come in three sizes: small, medium and large. I have some of each and use them constantly. 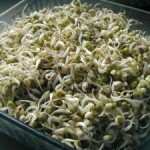 I use them for sprout storage, leftovers, reheating leftovers, aging cheese, and more. If I am putting a dish in the freezer for longer than a week or two, I spread a piece of natural wax paper or natural parchment paper across the top of the base before putting the lid on. The lid is heavy enough that it weighs that down. For long-term freezer storage, you might be looking at an issue of freezer burn as these are not completely air-tight. The lid has a lip that sits inside the bowl's edges, making a pretty good fit. When I use the containers for storing wet leftovers in the fridge, nothing dries out. I think they're doing a good job, but again, it is not air-tight. Lining the lid with natural wax paper or natural parchment helps with this. I wanted to include Pyrex bowls, but their plastic lids are #7 plastic. According to this website, we should avoid #3, #6, and #7 plastic they can contain BPA. Not all of it contains BPA, but it isn't labeled separately. I think a phone call to Pyrex is in order. Or, does anyone already know this? Update on Pyrex! The comments in this blog post contain a letter from Pyrex (World Kitchen) stating that their lids do not contain BPA. This is good to know, event thought it is a partially plastic solution. Pyrex may be more affordable than the Anchor Hocking bowls and you'd be able to achieve a tighter seal. Still consider lining the plastic lids with a layer of parchment or wax paper to separate the food from the plastic and to avoid freezer burn. What advice would you give Jen? What do you use for non-plastic freezer storage? Thanks for sharing your ideas! And thanks for all the great answers given in last week's Q & A on grain mills. You're all fabulous. Got a question for the Q & A series? Use the contact form to let me know. I recently purchased some glass containers from Costco that have snapping lids. The lids are plastic, so I just don’t fill the containers too full. Those would work perfectly in the freezer. I have not had any success in freezing broth in canning jars. No matter how many times I have tried they always break. Soup I think is okay, just not broth. The BerNARdin jar company recommends using the straight sided jars for freezing liquids. And leaving enough headspace to allow for expansion of the liquid. When I freeze broth and other liquids, I leave the lid loose until freezing has taken place. Just make sure the jars stay upright ’til the contents have frozen. Thanks, Tiffany – do you happen to know what # plastic those lids are? I just updated my post with info about avoiding #3, #6, and #7 lids because of the possibility they contain BPA. Pyrex lids are #7, but I found a letter from Pyrex on a blog stating they are BPA-free. It would be good to confirm they are still made that way. I have this very same question. We freeze veggies and fruit from our garden, and we use plastic bags. I hate doing it but do not know what else to do. I do can, but I am not a big fan of canned corn, broccoli, cauliflower, or beans. Besides I have more freezer space than home storage space. I once read that if you do not reuse the plastic bags that makes a difference, but then again I don’t want to dump them. I do freeze broths and soups in mason jars. I make pies ahead in glass pie plates and wrap them in freezer paper. You could do that with casseroles (make them in pie plates). With some of the fruits and veggies, I freeze them on a cookie sheet first, and then transfer them to the plastic bags, for some reason I feel better about that. But it is very time consuming when you are freezing 50 pounds of strawberries. I too would love any advice. .-= Jennifer´s last blog post… Breaking News =-. Ziplock says they are BPA free. And canned food is the worst for BPA. Almost all cans are lined with BPA plastic. And consumer reports said even the cans that said BPA free were not. The worst if I remember right was progresso soup and tomatoes. So stick to the home grown stuff its better for many reasons. I don’t like plastic in my food in general so I try to just eliiminate it when I can. One of the head researchers in BPA said she still freezes stuff in plastic, but would never used canned food. Some of the mason jar lids also have BPA. Oh so fun. I hate that its such a pain to get it out of my food. Oh the costco locking lids glass containers are #5 for the lids. And I think they are a good price. Can they be frozen? The lids are #5, the brand name is Glasslock, but I was wondering if putting parchment paper between the food and the lid if that would help, or if the “fumes” would still get to the food? Tiffany – the older the plastic, the less it off-gases. Most of the fumes are when it is really new. Probably the natural wax paper would be better fume protection because the wax isn’t as porous as the plain parchment paper. Jessic – Thanks for sharing those details. Jennifer – In that blog post linked from my post, someone mentioned saving glass jars of the same size – she uses them for all her fruit and other foods. If the jars are the same size, they even stack well. Hard to imagine 50 pounds’ worth in jars,though. What about making packages of them out of natural wax paper? If you plan to freeze a pie or casserole, or anything else that will be rewarmed in the same dish/pan you make it in, but are short on glass storage, you could always freeze it in the dish/pan until solid then defrost it just enough (think of releasing jello from a mold) to pop it out. Then you can wrap it in waxed paper and slide it into a gallon ziplock bag and freeze. When you’re ready to rewarm it, just remove the wrappings and rewarm it in the same dish/pan you originally froze it in. I’ve done this with apple pies, casseroles, shepherd’s pie, etc. It works great, and you don’t have to have cabinet space, or cash outlay, for a whole bunch of glassware. Kimber – Thanks, great tip to freeze in the container and then pop it out. I do as Kimber does, except I will pour/scrape stuff into a bread pan or other pan with the shape I want (square bottom, flat top). Then I freeze, remove the frozen cube and wrap in the outside paper my natural beef comes in. The beef is double wrapped and so the outside freezer paper is clean (recycling don’t you know). I don’t know if wax freezer paper offers any dangers to already frozen foods, but I don’t think it does. I also freeze in pint mason jars – I put the food/liquid in the jar hot, below the shoulder of the jar – this is very important as it is the change in shape that causes most cracking. I then leave it on the counter for a bit so it can cool, then I cap it with a metal lid and place in the refrigerator. After a few hours I remove the lid ring leaving the cap and put it in the freezer (life the cap to make sure no seal has occurred – cap must be loose). And I never have jars crack. I have used the plastic freezer bags after a fruit is frozen. For example, I freeze blue berries on cookie sheets, when frozen I put them loose into a freezer bag and back into the freezer. This way the berries are not stuck together, and we can easily take out just what we need. I use the huge bags. I like the soft, shape changing ability of this storage method, but I don’t like using plastics in any manor – so I’m still looking for a replacement method to achieve the same result. Yes, you did, Jami! 🙂 About the “hot” you mentioned. Do you put “hot” food in a “hot” jar – that would make sense to me to avoid cracking. But “hot” food in a “cold” jar might crack the jar. I think this is what you meant but want to clarify. Thanks for your other tips, especially about keeping the food below the shoulder. That makes perfect sense. I like the storage containers from the tickle trunk(link below), they are made of food grade stainless steel. The same company has other stainless steel items too, like straws and ice cube trays. I only have experience with their water bottles and storage containers but I’ve been very happy with them. Oh, thanks, MacKenzie – I’ve wondered about those before, so it is good to hear that you know and like them. Have you used them in the freezer? Hey Wardee, I follow your blog and am passionate health foodie who recently discovered Real Food and WAPF this year (well, last year). I have been devouring books and everything I can find. However I am still stumped on one issue. What type of olive oil do you think is best to buy? I know that we should look for one in a dark bottle, organic, with very little refining, cold pressed, from Italy, etc.. but I am having trouble discerning from all the brands! I currently have a Carapelli olive oil, but the taste is very strong (which I assume means it’s not very refined) but I just want to find a good olive oil (or two- a lighter and stronger tasting one) that has the most health benefits and as close to the real thing as possible (also without paying an arm and a leg). I would appreciate any info you can lend on the subject! .-= Meagan´s last blog post… Cinnamon Scones =-. Just a thought—I had a pyrex dish to explode in the oven so have used them for cold food storage . A suggestion for filling glass jars with hot food is to place a long handled metal spoon or knife which will seems to help with getting rid of some of heat in food. Does this really, truly mean that I can take one of those glass dishes full of frozen food directly from the freezer, and pop it into the oven? I would think that it would shatter or explode from doing that. Have you actually done this and had no difficulty with it? The Anchor Hocking dishes ARE expensive, and I do believe they are “worth it”, except maybe for people like me who are very clutsey and have a tendency to drop things and have them shatter all over the kitchen floor or sink. We have something glass/porcelain, etc. probably break about once a month at our home, mostly my fault…and not my kids’ fault. That’s why I’ve been a bit resistant to purchase glass storage containers, although I did buy some on Black Friday for an incredible price. The price was so low on the Pyrex glass storage containers that I couldn’t turn it down. The Pyrex products I bought in November 2009 were a 2009 product, and the box said right on the front plus in the packaging that the plastic lids were BPA-free. That made me feel a lot better about using the plastic lids. When we have leftover soups and sauces, I just feel better about using a lid that will seal well. I do have another question about your posting. If we know that particular plastic sealing lids are BPA-free, then is there any other danger in using them with foods that are not being heated in that container with the plastic lid on them? I know that I always cool foods down in the fridge before I place a plastic lid on the glass storage container. So if the lid is BPA-free, then I’m curious about why we would want to use natural waxed paper or parchment paper as an in-between from the glass container and the plastic lid. Is this overkill? Or do you have a scientific reasoning for using additional waxed paper or parchment paper? .-= Julieanne´s last blog post… The Screwtape Letters, by C.S. Lewis (dramaticized audio CD’s) =-. When I said: ““Anchor Hocking has some great glass storage dishes that go from the oven to fridge to freezer to dishwasher.” I didn’t mean to suggest that one should immediately transfer from freezer to oven, though I will check my documentation (I kept the papers) to see whether they recommend it. What I meant was more to focus on their versality. So thanks for asking me to clarify that. I’m glad you found the Pyrex dishes – it sounds like a great deal and a very useful item in your kitchen. Thanks for mentioning the 2009 message from Pyrex concerning them being BPA-free. It doesn’t mean your containers are #3 plastic, but they could be. If they did contain phthalates, or if they had some other harmful substance that off-gasses or leeches into your food, that’s why you’d consider separating the plastic from the food with a unpermeable or semi-permeable layer – or not using plastic at all. And just so you know, I have a bunch of Pyrex containers with those #7 lids myself. I haven’t heard of phthalates or anything else harmful in #7, and I’m not trying to be an alarmist, but we don’t know everything yet. We all have to weigh these options and I’m sure we’ll all have different solutions and different concerns. And that’s okay. I’m glad people are talking about it. I recently read an article stating that Pyrex changed their manufacturing, their dishes are not as good as they used to be. There have been many “explosions” of the glass dishes upon heating. If your dishes were purchased several years ago they are supposed to be okay, it is the last I think 10 years, maybe 5 that they changed. So be careful! A friend of mine had one explode in her oven, she said it was a mess, and ruined all the food that was in it, obviously! I use Ball wide-mouth pint glass jars for freezing broth, soups and purees. Ball says they are freezer safe and they have a fill line. I sometimes use Kerr wide-mouth pints too and haven’t had any breakages yet but I am careful not to overfill. I don’t leave the lid off to freeze them.When I need broth I run some lukewarm water and let the jar sit in it for a little while and then am able to slide the broth out into a saucepan to finish thawing. I like to have a freezer full of turkey broth, some with meat, at all times. It is especially nice to have if someone is sick and wants broth or just for quick meals. Wardee, to clarify – I do not pre-heat my jars. They are canning jars, and I’ve never had any problems with the jars and hot liquids. This is my personal experience and may or may not be what others experience. In the beginning 🙂 before I deduced the problem with curved glass shapes I had jars crack in freezing, but none since. I will add that old peanut butter jars (large) work nicely for freezing as they have a steady cylindrical shape, with no curves, and wide mouth, but I would not trust these with hot liquids. Thanks to everyone for the terrific ideas! I appreciate your insights! i just leave the lids off in my freezer until they are fully frozen. If I dont do this, they crack….everytime! So, what about #4 plastic ziploc type bags (not ziploc brand?). Western Family uses #4 plastic and they dont have that yucky smell that Ziploc brand has. I wonder if they are okay for things like frozen fruit from summer harvest. We have limited freezer space so jars would be tough to use. Anyone have any thoughts? I need something moldable. I know it would be better to be rid of plastic altogether but when there isnt a better way…? Also, what about buying the natural value waxed paper bags and filling them with fruits or veggies and then freezing them in plastic? Just a thought that occurred to me as I was reading the posts. By the way, I got my Family grain mill. I love it! My favorite thing so far is that I can roll my own oats. I also love the fresh taste of the flours. On more questions…not concerning this plastic/glass issue: Is there are blog out there that is GF, DF and mostly nut free that follows the NT lifestyle of eating and living? I hope to be like your family Wardee, that can now eat these allergens but in the meantime I have been creating so many of my own recipes (along with a fair share of failures) that I’d love some shortcuts to basic recipes. What about Natural Value brand ziplocs, saran wrap, sandwhich bags, etc.? flaw. Id love to hear the collective minds sort through this issue. My vote is for free storage – glass jars from spaghetti sauce, etc. Do be careful of cracking, but they’re great for soup and broth especially. I don’t really worry about the plastic lids on my Pyrex, because the food hardly/rarely touches the lids. Also, the Gladware style plastic storage is no. 5 plastic which does not contain BPA, and even plastic bags, no. 4, are BPA free. Who knows what the next problem in plastic will be and if these will be safe, though. I second Jory’s question about safe cookware. Always tons of info out there on that issue! Jory – I don’t know the difference between Ziploc bags. I agree that it is hard to avoid plastic sometimes. I use Ziplocs when there is no other choice. I frequently wrap things in natural waxed paper or parchment paper (like muffins or cookies) and then put them in a zipper bag for the freezer. It not only makes reusing the bag easy (no mess) but my food doesn’t touch the plastic. I also wrap dehydrated tomatoes in the wax paper bags as you mentioned and then put those in a ziploc for the freezer. So, all good options! I’ll keep my eye out for a blog like that. Kimi @ The Nourishing Gourmet ( http://thenourishinggourmet.com ) does many dairy-free subs and often makes grain free recipes, not necessarily gluten-free, but if there aren’t grains that would work too. Nuts are usually optional in many recipes – I think you’d like her blog. My fear is that the food will cause condensation, up on the inside of the plastic lid, and then drip back down into the food. So, even if the food doesn’t “touch” the lid, there is still the condensation factor? For cookware I use mostly glass pans, SS stock pots (but ceramic is much healthier) and cast iron for my skillet. I like wooden and SS utensils. It’s muffin tins and cookie sheets that I have a hard time with…. I need to upgrade in these areas and could use advise. Jami – I got ss cookie sheets through Azure – the norpro brand. And they stink. 🙁 So flimsy. They bend out of shape all the time in the hot oven, making a loud pop that disrupts whatever you’re doing. Startles me every time. I am still using my old aluminum muffin tins – but I always use paper liners so the food doesn’t touch the aluminum. That doesn’t seem quite so urgent a fix as we’re making it work for the time being. Thanks for your suggestions! I love the pampered chef stoneware for baking. I have a muffin pan, bread pan, and bar pans that I use constantly. A little pricey, but they are practically non-stick, are easy to clean, heat evenly without burning the bottoms, and have a lifetime warranty! About the lids… These containers are expensive, we all agree, but I do love the glass containers. After using them for 2 years, I have the following problems: edges chipping & do not retain the tight seal (bone broth draining out) and those stupid lids do not last at all. I have had the anchor hocking type and they crack, and the GlassLock type and te flip edges break along the seam. So I have several without lids. They need to sell them seperately in my opinion! I would never go freezer to oven, I’ve had Pyrex explode on me taking salmon out of the oven – and someone opened the back door – cold air hit the pan & smash!! Was just going to say the same as Tina said. If you lined the bottom of an 8×8 glass baking dish with natural wax paper, poured the dish or casserole in, and then froze it – it would pop out and you could do another wrap over the top of the wax paper and stick it in a gallon ziplock back and keep it in the fridge. It would not be touching the plastic but would save tons of space (not having the glass dishes in the freezer). We bought a lot of glass dishes and do freeze in them – our problem is that, as we unfreeze and eat them, we dont have anywhere to store our empty containers until we make big batches again to refreeze. That and storage space in the freezer made me start researching how to freeze in gallon bags but not have the food touching the plastic. The straight sided glass canning jars are safe for the freezer. Straight-side canning jars for us. 4oz, 8oz and 16 oz sizes but I haven’t found any straight sided quart so that is harder for me and I’m not willing to take the mason jar challenge. (I did read that filling them not as full and freezing on their side will allow more expansion room and considerably less cracking. but I would have to defrost fully to remove contents and I’m just not together enough to get that done.) I’ll consider investing some anchor hocking. I want it to be a size for soups & stews that can be dumped into my crockpot frozen and reheated since we do that a couple nights per week when I’m working. I do use Pyrex for the refrigerator and avoid having food touch the lid. I don’t know if that is more acceptable but we have found it affordable. I think that the parchment paper suggestions are new in this post? I don’t remember reading that before and I think that is a great option for my canning jar and pyrex. Thank you for that! I didn’t realized that the bpa can off-gas and thought it was safe if the food didn’t touch it. Since I left my response I found 24 oz straight-sided canning jars that are safe for freezing and I’m also using those. Since using the 1-1/2 pint Ball jars I haven’t had any break. They have a fill line for freezing like the pint jars, but are a bit taller with straight sides. I don’t wait to put the lids on either. I probably freeze at least a half dozen jars a week. I’ve also wrapped solid items in waxed paper before putting in plastic bags and it works well. Labeling helps. Recently I saw an article saying the chemical in BPA-free is worse than BPA, which is what I feared. As of March 2010, real Tupperware brand products sold by Tupperware US & CA have been BPA-free, according to the company’s website http://www.tupperware.ca, see the bottom of the page for a link to “About BPA”. A lot of comments mention Pyrex. I use Corning-Ware. It is made of pyroceram which has a lower rate of thermal expansion than Pyrex, so it will handle temperature changes better. (And Pyrex is yet better than glass.) I don’t have enough pieces to let them spend time in the freezer, but I have put frozen lasagna in a room-temp pan and put that straight in the oven. You mentioned that older plastic containers don’t put out as much BPA. I thought I read the opposite somewhere (Mercola, perhaps). Do you have data? I have probably 100 Ball brand plastic freezer containers that have been used every year for at least 20 years. Too old for a number on them. But I would like to know whether they are still or ever have been safe to freeze in.